Denmark, a country occupying the peninsula of Jutland, which stretches northward from the center of continental western Europe, and an archipelago of over 400 islands to the east of the peninsula. Denmark is seen as a wonderful place to travel, and an honest place to do business and the Danish market benefits from a high degree of administrative efficiency. The weather in Denmark is relatively mild compared to other Scandinavian countries, but it is divided into four seasons, each with their characters. For a traveler, it is essential to know what to expect at the time of visit, how to dress and how to plan your stay. While you can come to Denmark all year, it’s worth recognizing what to require in each period before booking your tickets. High Season (mid-Jun-mid-Aug): Warm climate with long sunlight hours. All charms and views open so anticipate crowds and higher service prices. Mid Seasons (May-Jun, Aug-Sep): Mild climate. Fewer crowds make for a perfect time to visit Denmark. Low Season (Oct-Apr): Cool and wet climate with little sunshine hours. Reduced hours for popular tourist views and many outdoor attractions are closed. Though, big cities have Christmas lights and ice-skating. 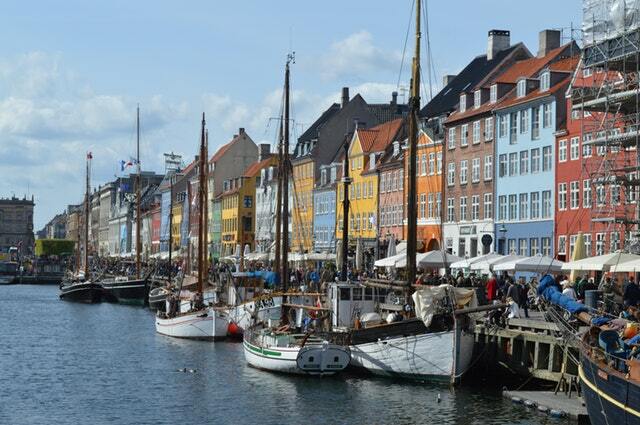 Denmark’s culture, customs and community stalk from a rich history and an ethnically similar people. In Denmark, life can be defined by these three features of Danish: politeness, simplicity, and uniformity. A simple life is the basis of the culture of Denmark. Not much importance is given to settlements or high income, and bragging is considered offensive. Another significant part of Denmark culture is ” hygge,” which is the notion of feeling comfortable and snug during times such as holidays when friends relax and eat together. There are three main meals in Denmark: breakfast and dinner are typically eaten at home, whereas lunch for practical reasons has to be eaten elsewhere and often consists of a packed lunch brought from home. Denmark’s food experience is more than just seafood. The share of a traditional meal contains smorrebrod. There’s also the frikadeller (meatballs), hakkebof (chopped meat patties), kolde bord (cold buffet) for lunch, polser (long hot sausages), and several other dishes that are a typical food in Denmark. Apart from seafood, the history around Danish food has become more varied in recent years, and you can get any food, particularly in the cities. If we talk about the Danish language, then it has been a powerful Scandinavian language, due to the complex history of political power and authority of Denmark. Even today, Danish is still considered significant amongst the Scandinavian languages. It works as one of the first languages of the European Union, is a practical language of the Nordic Council, and is also required in the schools of different Scandinavian countries. Many linguists agree that the Danish language has experienced more necessary adjustments than any of the other old Scandinavian languages. Due to connection with Hanseatic traders in the middle ages, the Danish language received several prefixes, suffixes, and words from the Low German language. It is dissolved the traditional system of the Norse language, combining masculine and feminine into a single gender. Now, nearly all the business activities are taking place worldwide through the online facilities as it is quite an easier and quicker option to reach accordingly. If you also want to improve your business progress worldwide and effort to build a good business relationship with Danes, but the language barriers stop you doing this then opting for a professional Danish translator would be pretty easier for having the accurate Danish to English translation results and valuable for you to get an express solution of language translation. Most of the people choose the top professionals who would be more natural for improving their business in the right standards.